The DreamCloud mattress is a recent hybrid mattress that has grown rapidly. Their growth is in part due to a 365-night sleep trial and a forever warranty with no-questions-asked return policy. The DreamCloud mattress is manufactured in China and shipped from fulfillment centers in Washington state. The 15” DreamCloud mattress is advertised as a Luxury Hybrid mattress. The mattress consists of 8 “hand constructed” layers which include various types of memory foam, latex, and innersprings, with a foundation layer of high-density foam. Low price: Thanks to the direct-to-consumer model, DreamCloud is able to offer a sturdy, 15” luxury hybrid model with a cashmere cover for less than the traditional luxury models in retail stores. Consumers can save even more by using our promo code for $200 off the DreamCloud mattress, bringing its price down to $1399 for a Queen. Quality materials: This is a tufted mattress which means the mattress is assembled with a tufting needle that holds everything together and levels out the support and transfer of motion. All the layers are fused tightly this way, and the tufting creates a consistent feel across the mattress without the sensation of rolling into the middle. The 8 layers are topped with a cashmere cover, and all foams are certified. Support: Several features which contribute to the excellent support of this mattress are the high-density foam layers, the inclusion of a 5-zone pocket-coil system, and an additional layer of latex. The 5-zone pocket-coil system provides the proper spinal alignment along with perimeter support to prevent edge collapse, while the latex layer offers extra lumbar support. All of this is topped with a cooling-gel-infused memory foam layer and combines to create a true medium-firm feel rated at a 6 on the firmness scale. Customer service: The DreamCloud model is brand new, so glitches or challenges with its delivery have yet to be determined. The company does seem to go out of its way to respond to complaints online. Reputation: Again, this boils down to the early challenges of a young company that grew exponentially right out of the gate and ran into trouble with fulfillment and with keeping its promises to customers. The company has earned an F rating with the BBB, but at the same time has earned praise and accolades from verified buyers who love their mattresses and a 20% increase in sales per month in its first year. Last year, DreamCloud announced plans to bring a luxury hybrid mattress to the direct-to-consumer market at an affordable price. The company seems to have accomplished that goal. Co-founder Craig Schmeizer’s stated plans to provide a full luxury experience for mattress buyers are evident here with features such as a “sleep concierge team” on the website and the white glove delivery service. DreamCloud debuted in 2017. The brand sets itself apart from the competition early on by offering a 365-night sleep trial, the longest in the industry, as well as an “Everlong” warranty that warrants against defects for as long as you own the mattress. As a new company, there is little on DreamCloud at this time. Reviews are generally satisfactory and note the lengths the company goes to in providing a high level of customer service. Comfort and sleep quality are largely rated as highly satisfactory by online reviewers. Some negative reviews include phrases like, “too fancy.” The only reviews available at this time are from the company website, where it receives 4.8 out of 5 stars overall. The general consensus is that the company’s description of their mattress as medium-firm is correct, with a slight emphasis on firm. The hybrid DreamCloud mattress combines foam and spring layers to maximize both comfort and support. The materials used in this mattress are certified to be free of Ozone depleters, PBDE flame retardants, heavy metals, formaldehyde, phthalates, and Volatile Organic Compounds. The mattress is also guaranteed to be resistant to bedbugs. Base layer: The foundation of the mattress is a layer of high-density poly foam for support and structure. The tufted construction of this mattress binds all the layers together. 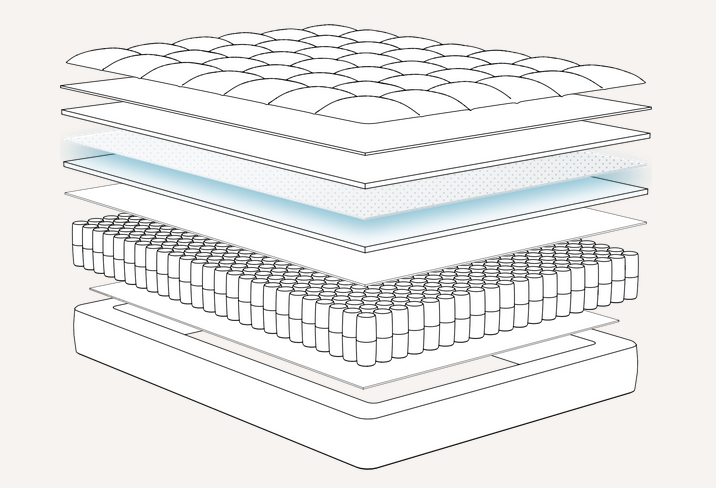 Mid layer: The mid-section of the mattress begins with a layer of natural latex, over 2 layers of high density foam, followed by the innerspring layer of zoned and pocketed coils. Top layer: The cashmere cover is hand-anchored to 2 top layers of memory foam, a gel-infused layer for cooling and a quilted layer for body contouring. When using our discount code, the DreamCloud mattress becomes a great deal, especially when compared to similar luxury brands. Save $200 off any size DreamCloud mattress with our promo code. The 365-night sleep trial allows you to try this bed for an entire year. Return shipping is free, and the company promises a full refund with no questions asked. Shipping is free to the contiguous US. The company does ship to Hawaii and Alaska for a fee. DreamCloud offers a white glove service for $149. If you opt for that service, they will deliver and set up your new mattress in the location of your choice and remove the packaging as well as your old mattress. Otherwise, the mattress arrives compressed and rolled into a sturdy bag. It decompresses quickly and setup can be done with one person. The mattress includes well-made handles for aid in transport, and the Queen weighs in at around 100 lbs. The warranty on the DreamCloud mattress is what the company calls, “Everlong,” meaning it is guaranteed to be free of defects for as long as you own it. The company also states on its website that they will clean or recondition the mattress for you at no cost. This warranty seems to be one of the reasons for the company’s rapid growth and popularity. The mattress is meant to be used on a basic frame, box spring, or on the floor, and using it in an “unusual way” would void the warranty. While you can expect enough bounce, due to the layers of latex and independent coils, to avoid the dead-weight feeling of some foam mattresses, it won’t be excessive. Couples report sleeping soundly without disturbance, as you would expect from this well-engineered mattress. This mattress excels in the area of edge support. The 5-zone system of coils creates an even distribution of weight, and true to its hybrid nature, the mattress holds up well for edge sitting or sleeping. Although the mattress is manufactured in China, the materials used and the attention to detail and craftsmanship all point to durability and quality. The mattress is new, however, so there isn’t enough data at this time to verify life expectancy. The warranty, which extends beyond many in the industry today, points to solid construction and a long lifespan. Customers report satisfaction with the firmness level of this mattress, which the company rates at a 6.5 and others have rated very closely at a 6. The tufted stitching contributes to the firmness and also allows for a uniform feel across the mattress without sagging. The high-density foam layers combined with an innerspring layer together provide a supportive structure underneath the plush topper. In engineering the DreamCloud mattress, DreamCloud has included features designed for maximum breathability (such as the cashmere cover) and proper air flow. The pocketed coils used here will help transfer heat through the mattress and away from sleepers. The cooling-gel layer of memory foam in the top layer of the mattress will provide heat transfer in the short term as well. This company has taken measures to use certified foams in the construction. Some offgassing when you open the mattress from the plastic packaging should be expected. But few if any complaints have been made by customers about any lingering smell. Expect the new-mattress odor to diminish within a day or two. The natural latex layer will add a bit of bounce to this mattress, which is otherwise considered great for motion isolation. Another feature that should provide more give-and-take than a strictly foam mattress is the pocketed-coil system. These coils provide nice resistance, but move independently for reduced transfer of motion. Overall, for recreational activities this mattress will perform better than memory foam. The cashmere cover must be spot cleaned and cannot be submerged in water or dry cleaned, although it is removable. The DreamCloud mattress is not meant to be flipped. As with any mattress consisting of foam layers, protect with a suitable cover and spot clean only using a mild detergent. Vinegar and water is also suitable for removing stains.